Louisiana – The acquisition of the Louisiana Purchase from Napoleon in 1803 by president Thomas Jefferson nearly doubled the size of the United States. Robert Livingston, America's Minister to France, said of the transfer, "We have lived long, but this is the noblest work of our whole lives ... From this day the United States will take their place among the powers of the first rank ... The instruments which we have just signed will cause no tears to be shed; they prepare ages of happiness for innumerable generations of human creatures." On January 10, 1812 the steamboat "The New Orleans," arrived at New Orleans from Pittsburgh, becoming the first steamboat to navigate the Mississippi River. Louisiana was proclaimed a state April 30, 1812 and the city of New Orleans was involved in the War of 1812, when the famous Battle of New Orleans occurred there on January 8, 1815. Simon had been at sea for ten or more years when he chose to settle in Louisiana. The newly acquired Louisiana Purchase, with its prospect of land and opportunity, brought many people there and Simon apparently was no exception. What influence, if any, did the involvement of Napoleon Bonaparte in that sale have on Simon Wiess' decision to go there is not known. Simon apparently lived only a short time in Louisiana, settling in Texas as early as 1833. He had either met the Sturrock family earlier in Louisiana or during subsequent travels there for, in 1835 in Natchitoches, Louisiana, he entered into a marriage bond with the Sturrock family for his marriage to Margaret Sturrock. He bonded himself to Margaret's brother for $12,000 and put up land titles equal to that amount as security. The indenture was an early-day bond marriage, which existed in one form or another in all the frontier states and territories during the first half of the nineteenth century. Such a document guaranteed that the bridegroom could adequately support a wife. After overcoming the objections of the Sturrocks, Margaret Sturrock and Simon Wiess were married in 1836 and moved to Nacogdoches, Texas to live. 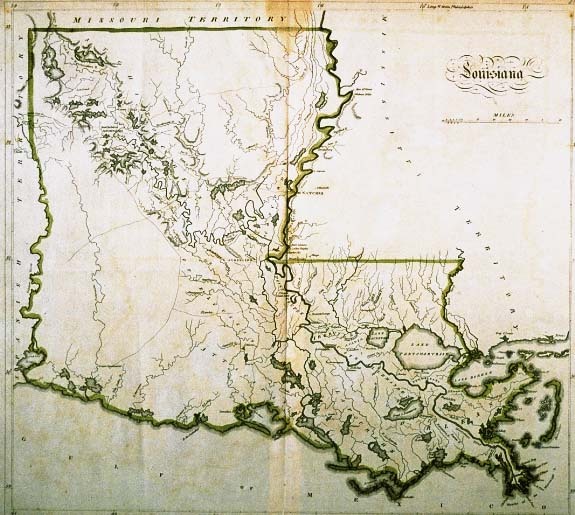 An 1814 map of Louisiana. The family name is WIESS, not WEISS! Report errors or site problems to the webmaster. Theme adapted from Genesis Metro Pro template.